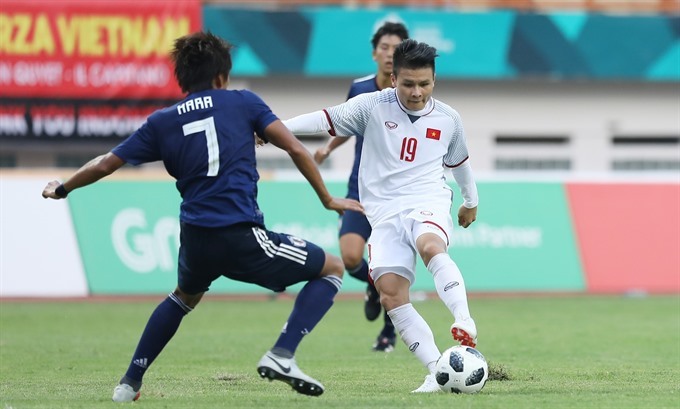 Việt Nam beat Japan 1-0 in their last qualifying match to top Group D at the Asian Games (ASIAD) 2018 in Indonesia on Sunday. The game was held at the Wibawa Mukti Stadium. Việt Nam’s head coach Park Hang-seo changed tactics for the match by starting two strikers in Hà Đức Chinh and Nguyễn Văn Toàn supported by Nguyễn Quang Hải and Nguyễn Văn Quyết. Việt Nam pressed in the opening minutes and were rewarded with a goal thanks to a mix up between the Japanese defender. Having taken the lead, Việt Nam were happy to sit back and soak up the pressure until half time, but lost midfielder Đỗ Hùng Dũng through injury. Japan started the second half with attacking intent, but their attempts were foiled by the Vietnamese goalie. South Korean coach Park continued to change his tactics to resist attacks from Japan with support from Nguyễn Công Phượng and Phan Văn Đức. In the 80th minute Japan finally found the net but it was ruled offside. As the clock ran down, Việt Nam had several chances to double their lead but failed to take advantage. “I am very satisfied with the performance of my players today. They proved their determination and desire to win even though they have already earned a ticket to compete in the quarter-finals,” said Park after the game. “This result will help to keep our confidence up for the knock-out phase,” Park added. Earlier, Việt Nam beat Pakistan 3-0 and Nepal 2-0. With three wins in the group, Việt Nam are ready to prove their position in the Asian region. However, Park was still cautious. “The win against Japan was down to will and determination. We didn’t give our rivals a chance. Ahead for Việt Nam will be difficult matches and we need to uphold maximum focus,” said Park. Moriyasu Hajime of Japan said that Việt Nam’s pressing style had caught them out, but they would try to improve in the knock-out phase. Việt Nam will play their quarter final on August 23.